After many frustrating hours, I finally got a Healthcare.gov insurance application to the final steps. I get to the application review step. Where it should show me a list of the people I want to insure, it says "No data available in table." What happened to all that data I entered, and reentered, and then reentered again? 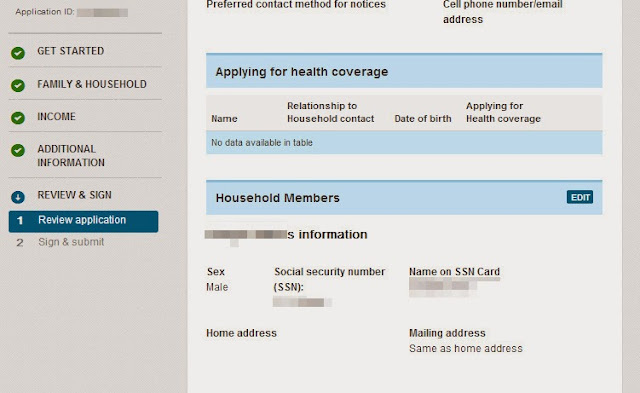 It shows me a list of household members and their Social Security Numbers, but shows no indication of which people I told it I want to insure. I can find no option to go back and select the people I want to insure. So, if I submit this, am I submitting a request to insure no one? Also, none of the "Name on SSN Card" data matches the full names I explicitly told the system are the names of household members' Social Security cards. The address information and many other items I provided (sometimes repeatedly) in the application process also show up blank in the review stage.